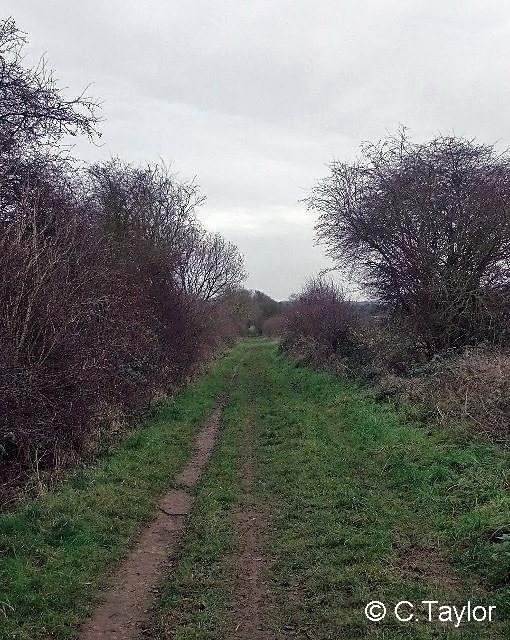 We've retraced our steps to Casthorpe Junction, 3½ miles from Belvoir, where a line branched off to the left. Harlaxton Quarries opened in June 1941 to help meet wartime demands on the iron and steel industry. 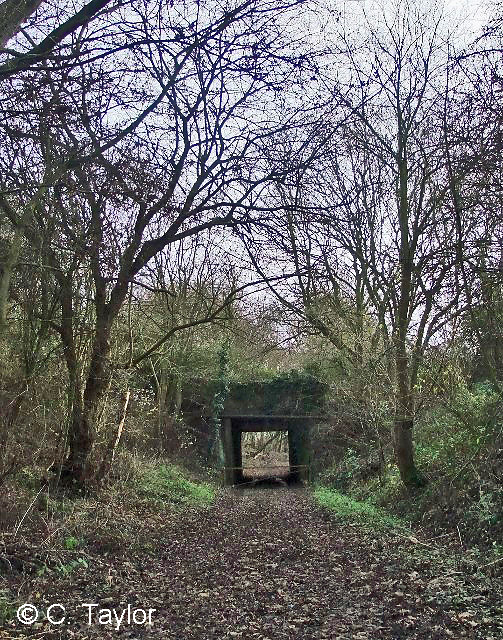 The LNER, later British Railways, owned the line for about 600 yards to Casthorpe Sidings, where wagons were exchanged with the mining company. 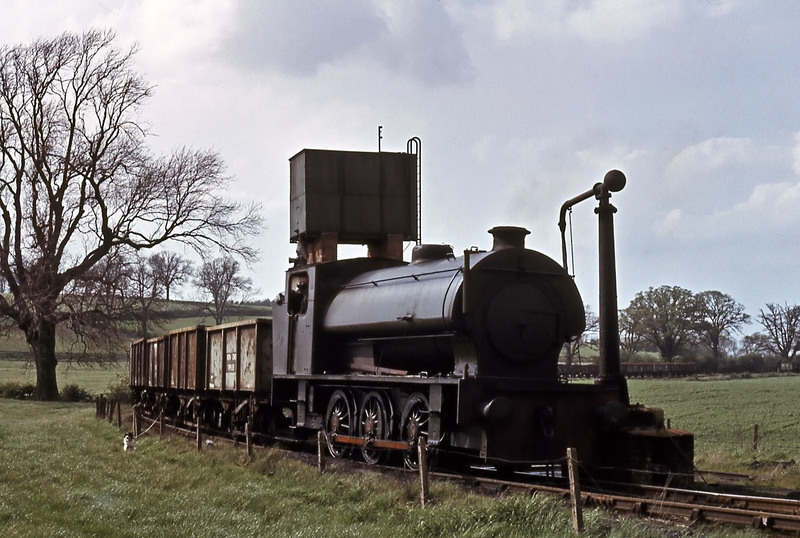 Between the sidings and the quarries the wagons were hauled by the quarry's fleet of locomotives. 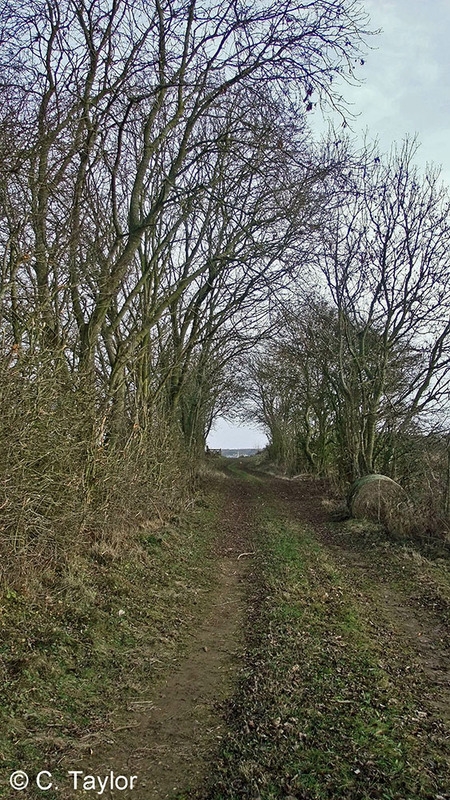 At the system's greatest extent the farthest point reached by rail was about 5½ miles from Casthorpe Junction. Quarrying was extensive until the early 1960s and many pits were opened and worked. Demand then reduced until finally, in February 1974 the last loads of ironstone left the quarries at Harlaxton by rail. In 1976 a new venture saw nearly all of the trackbed converted for tipper lorry operation to a loading dock at Casthorpe sidings. This operation was short-lived, however, and the facility closed at the end of March 1977. 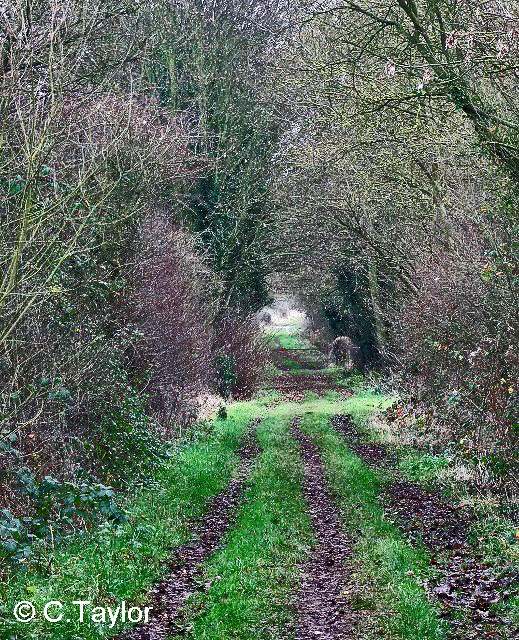 Traces of several phases of development of the railway can be seen on the walk, which covers the first two miles of the 3½-mile 'main line'. 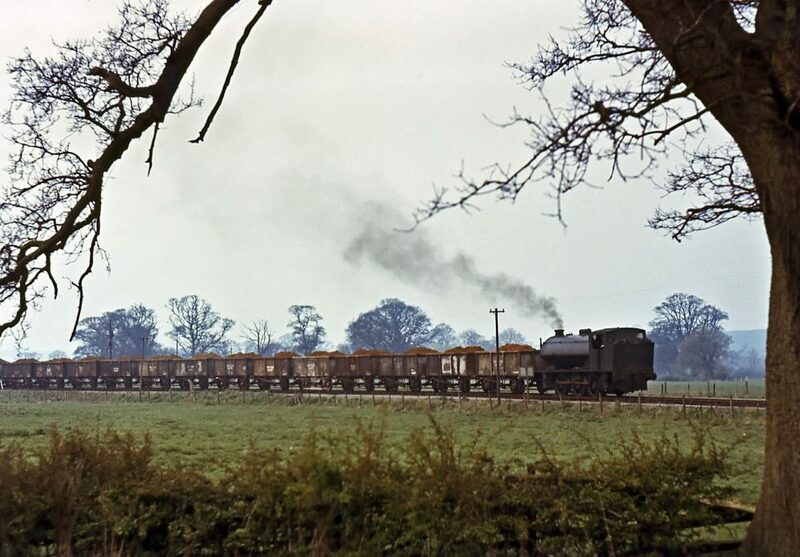 The header photograph (above) shows an ironstone train travelling towards Casthorpe Sidings from Harlaxton Quarries in the 1960s. Much of the line had a delightful rural setting. Here we are, back at Casthorpe Junction. Keeping right takes us to Denton and is covered in Part 2. 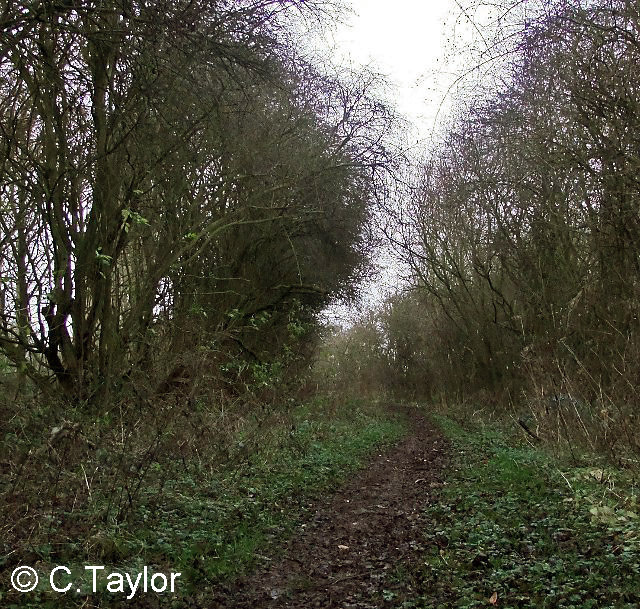 We're going left this time, down the branch which led to the Harlaxton quarries. Its quite wide here, room for sidings. No. 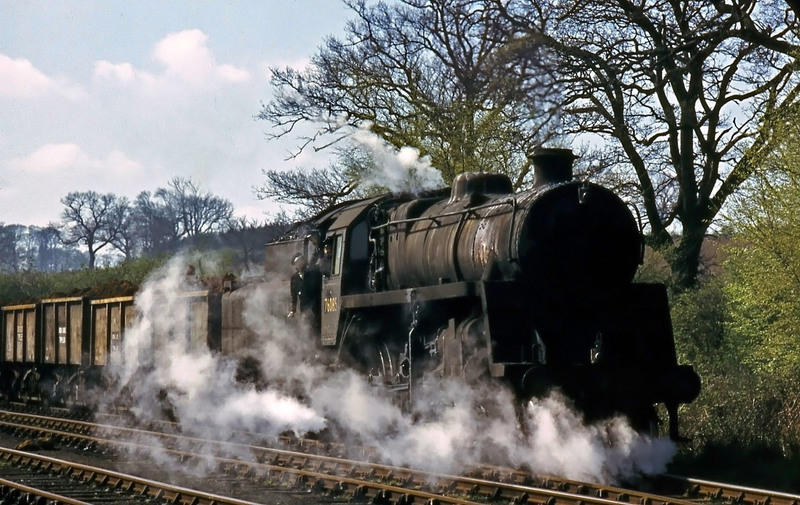 76085 at Casthorpe Sidings, leaving with an ironstone train on 28th April 1966. The driver, fireman and guard lean from the cab as their photograph is taken. They would have brought some empty wagons down the branch and left them in one of the other sidings - there were five parallel tracks here. 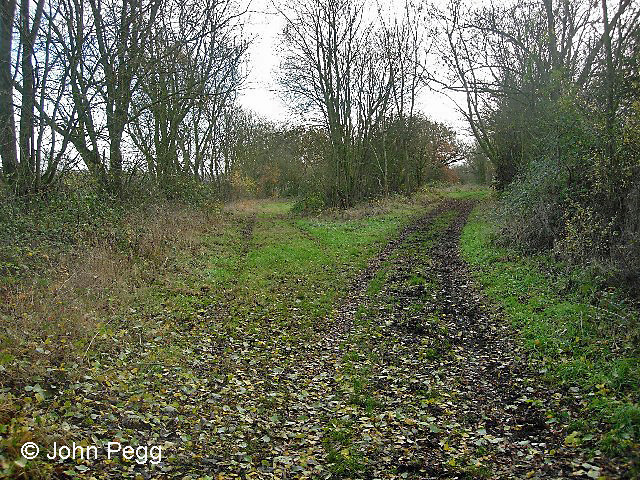 At the far end of these exchange sidings the mines' tank locomotives delivered full wagons, then they would take the empies back to the quarries. 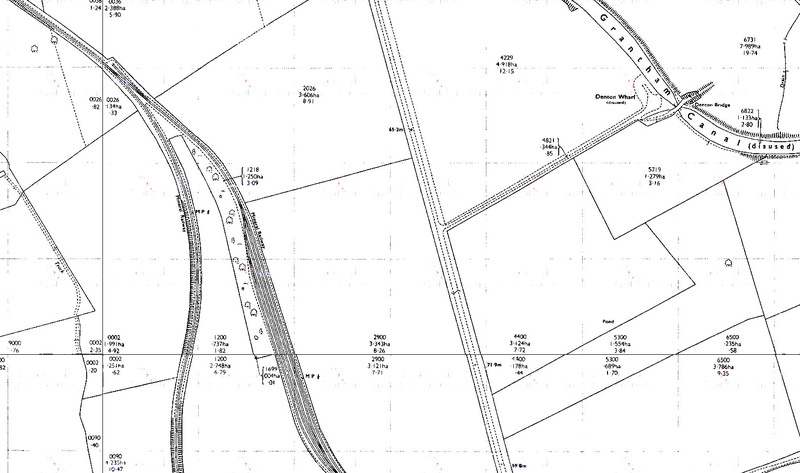 Casthorpe Junction and sidings. We're still keeping close company with the Grantham Canal just a couple of fields away. The maps are dated 1970 unless otherwise mentioned. Approaching the level crossing over the Casthorpe Road. On the map it mentions a 'Water Point' with a tank, here on the left. Perhaps thirsty engines could stop for a drink? Here's 'Gunby', one of the Harlaxton Quarries locomotives, leaving the exchange sidings with a train of empty wagons and passing the water tank perched on its tall brick pillars. 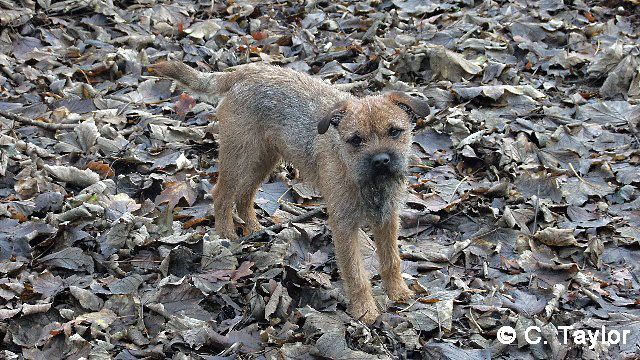 Can you spot the photographer's dog? The view today from where the front of the engine would be in the last photo. In front is the level crossing with Casthorpe Road. No sign of a railway gate. Did the crossing have gates, or was it an open crossing? Who's going to stop the traffic for us? No need to worry, there's a chap with a red flag. 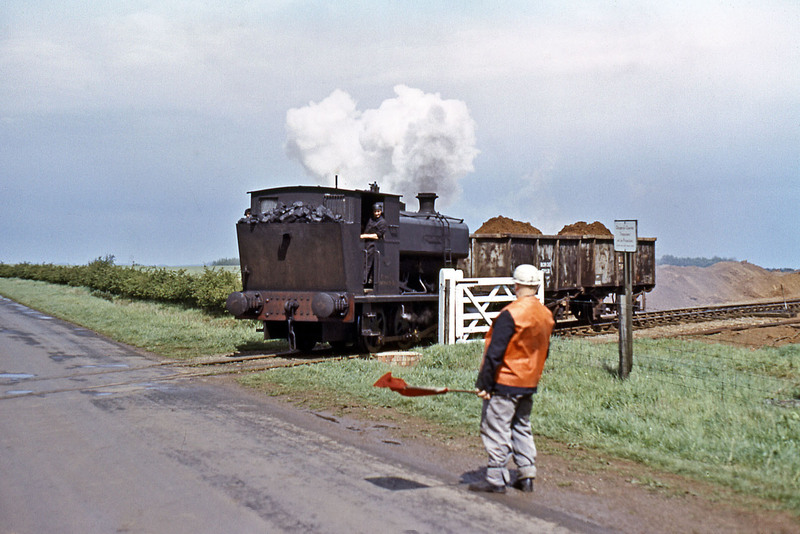 Barclay 0-6-0ST 'Rutland' is at Swine Hill Pit, crossing the road between Harlaxton and Hungerton higher up on the Harlaxton Quarries system. These wagons would travel over the Casthorpe Road crossing later in the day. 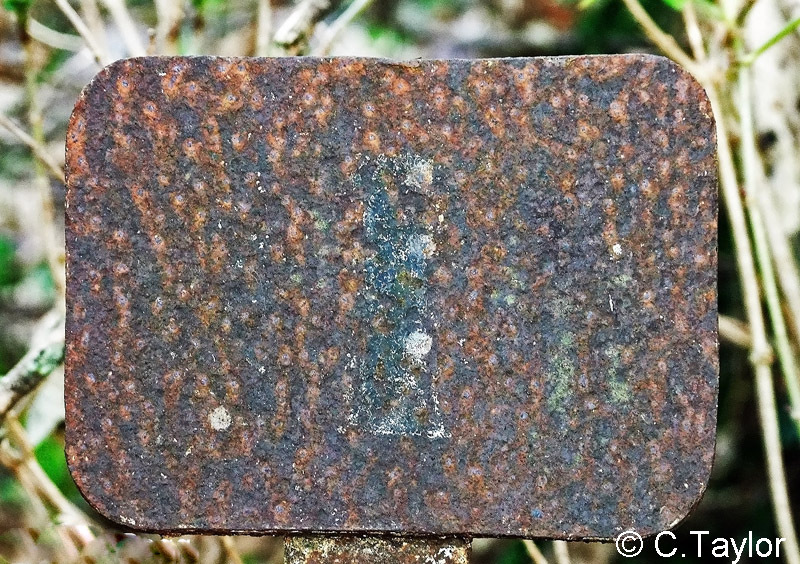 Taken in the area where the weighbridge used to be, could this be part of the weighbridge infrastructure? The posts appear to be rather large for a crossing gate. 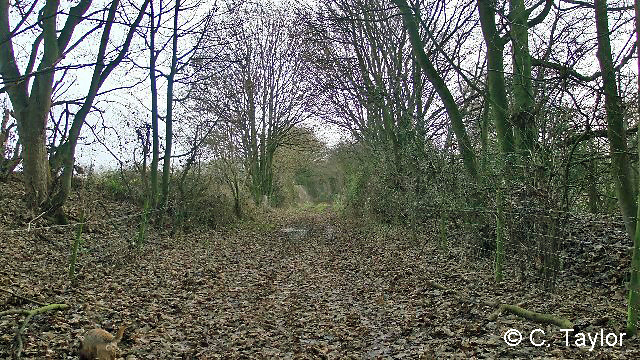 At this point we are walking on the track parallel with the mineral line, which is overgrown with the trees on the right of the photo. A distant view of Denton reservoir can be had on the left along here. 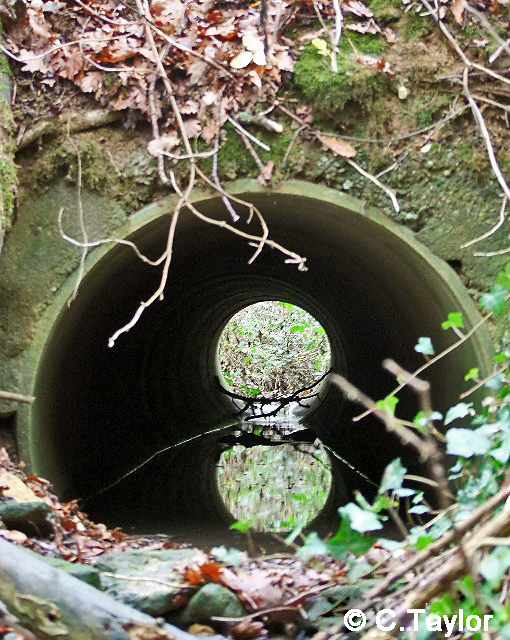 A small stream culvert with an interesting reflection. 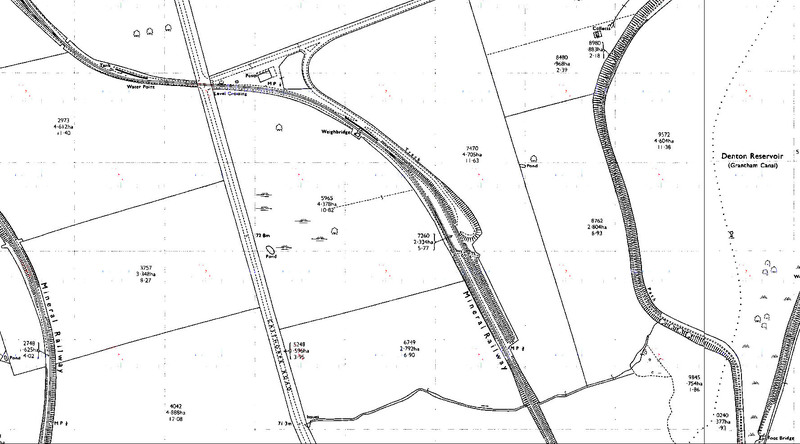 Top left is the 'Water Point' with tank, then the level crossing over Casthorpe Road, followed by the weighbridge. 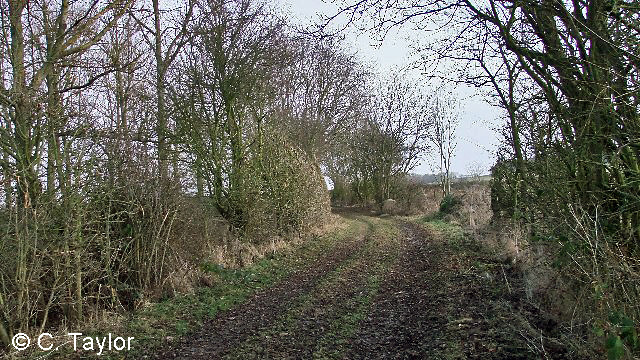 The wider area on the outside of the curve, beyond the level crossing, is the site of a siding which was the terminus of a lorry road, marked 'Track'. 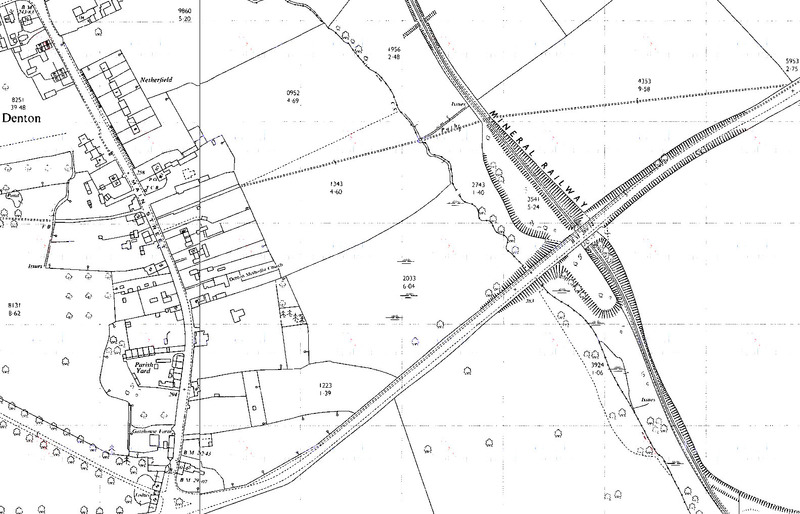 Bilt in the early 1960s, the road was intended to bring ironstone from proposed new workings two miles to the north east. 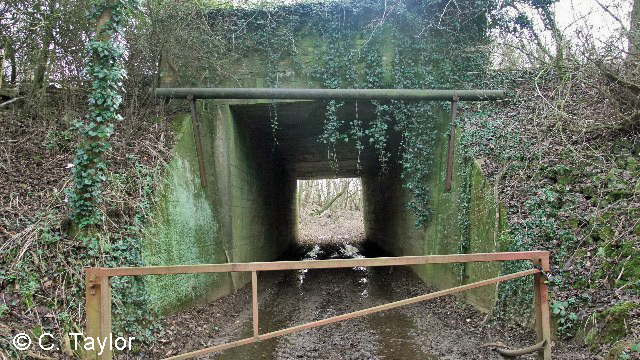 The lorries were to be unloaded into railway wagons at a tipping dock next to the siding, at the widest part at the centre of the map. 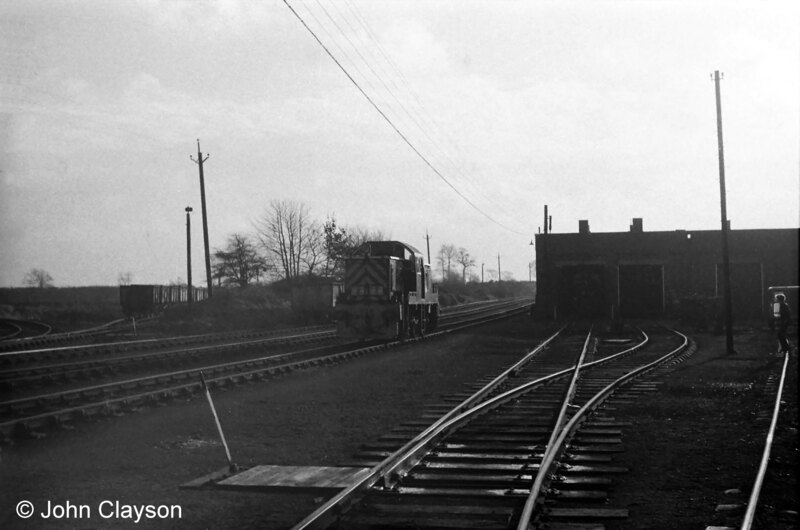 The lorry road, the siding and the tipping dock were completed, but the new quarry never opened. Near the bottom of the map the stream crosses under the line through a culvert, on its way to Denton Reservoir. 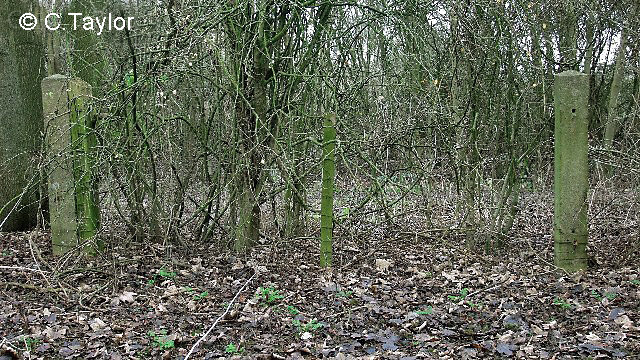 We are now walking on the mineral line; the old concrete fence posts are in the bushes on the right. A milepost can be found here on the left, although its difficult to discern the figures. The mile post. We think the figure's a '1' - we are one mile from Casthorpe Junction. Good walking on this stretch. This stream flowing under the line supplies water to Denton Reservoir from the Fish Ponds in Denton village. 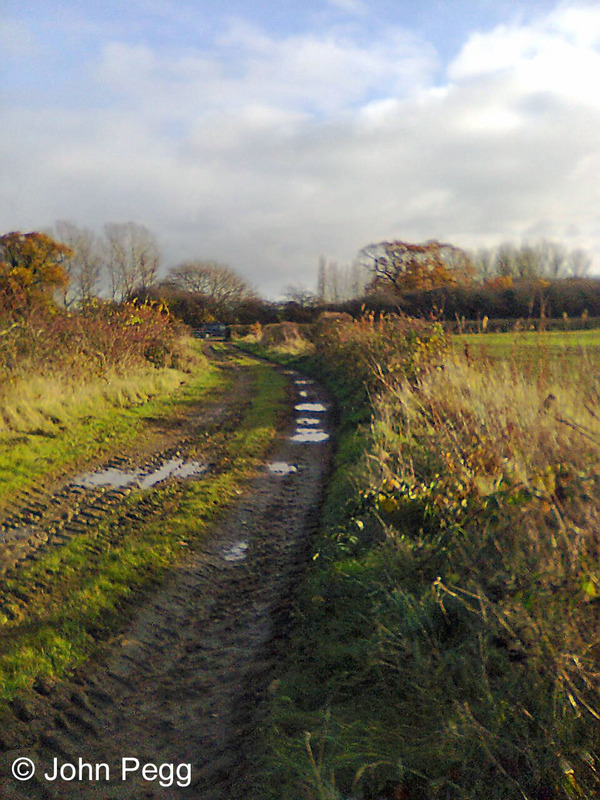 It leads to the Old Beck which becomes the Foston Beck, eventually meeting the River Witham between Hougham and Westborough. 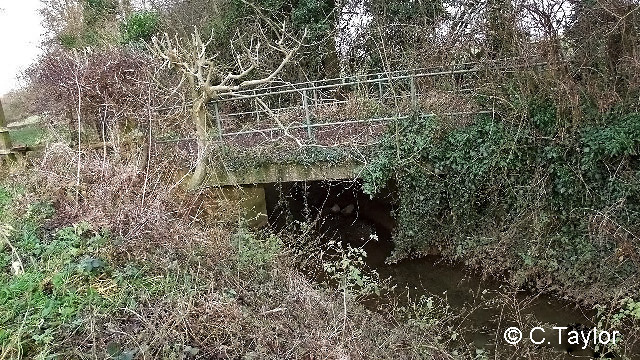 We think this bridge was rebuilt when the trackbed was converted for lorries in 1976. 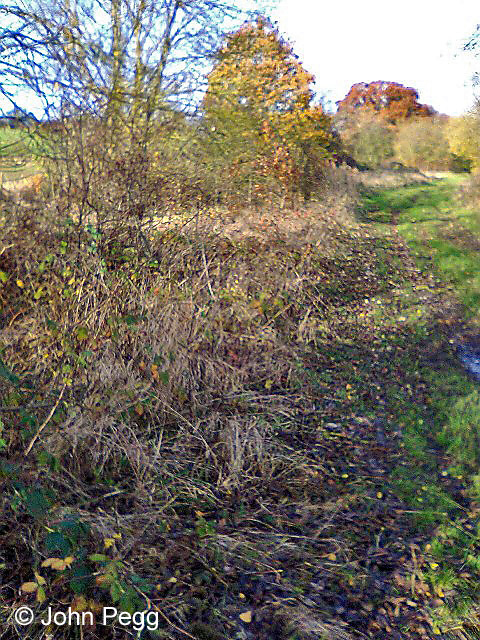 A long straight stretch, bridging the principal stream feeding Denton Reservoir and crosing Nether Lane on the level. We are getting close to the A607 now, the road runs left to right near the line of trees on the left horizon. Oh, and by the way we have been joined by a four-legged friend. Don't know his name, but he was keen to show us the way. We're now entering the cutting to go under the A607. 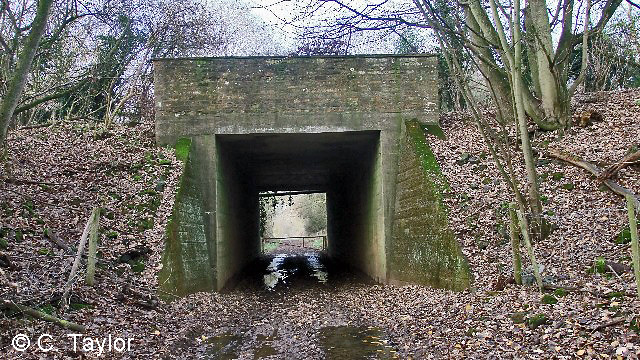 The A607 bridge - it looks a bit damp in there. The view from the other side looking back. Yes, it was rather wet! The bridge which takes the A607 Melton Mowbray to Grantham road over the line. 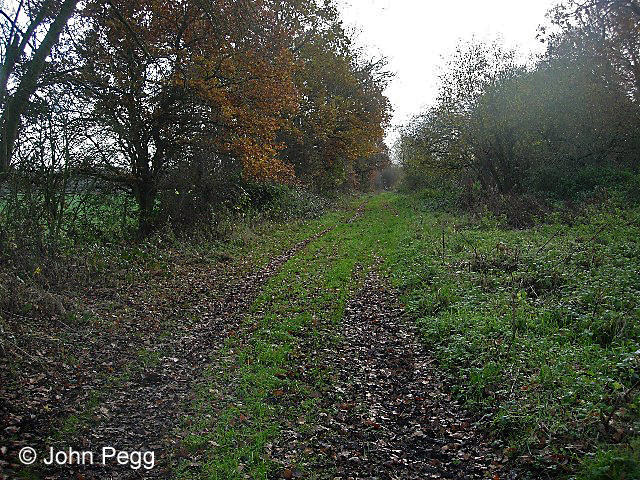 The line's in a cutting and road's been raised on an embankment, probably using spoil dug out of the railway cutting. 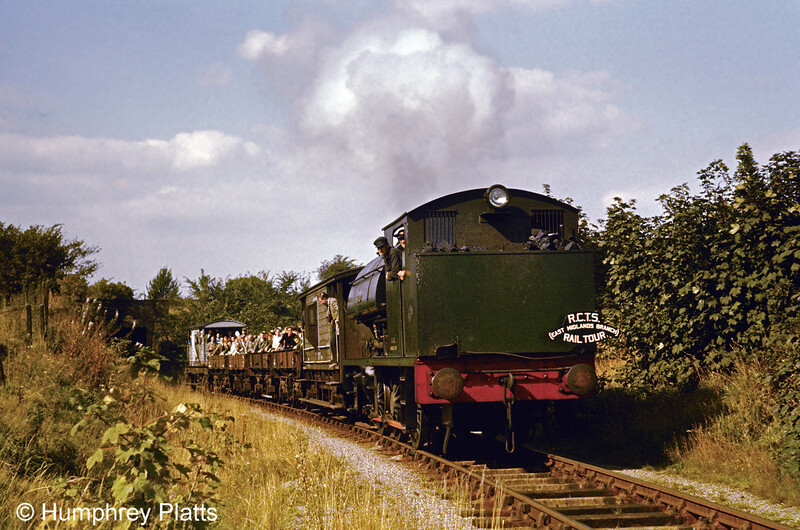 On Saturday 9th September 1961 the Railway Correspondence & Travel Society (RCTS) East Midlands Branch arranged a Rail Tour from Nottingham along the Woolsthorpe Branch. The first part of the trip was by diesel railcar to Casthorpe Sidings (seen in Part 1). The party of more than 100 then climbed into four open wagons for a trip to Harlaxton Quarries. The special train has just passed through the A607 road bridge. It's hauled by one of the quarry locomotives, 'Achilles', with Driver Steventon and Fireman Clapton in the cab. Glad we got out of their way in time! OK, we're safe again to contibnue our walk. 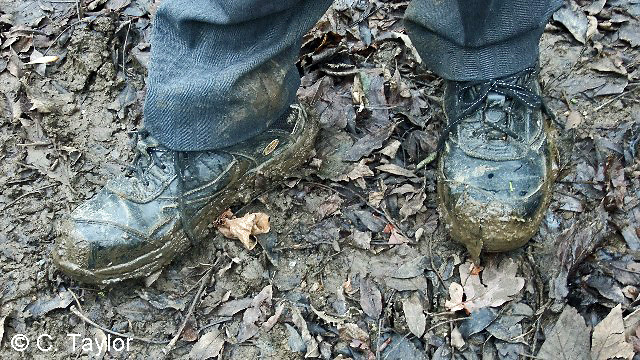 Our feet are drying off a bit now. Wonder what's round this bend? 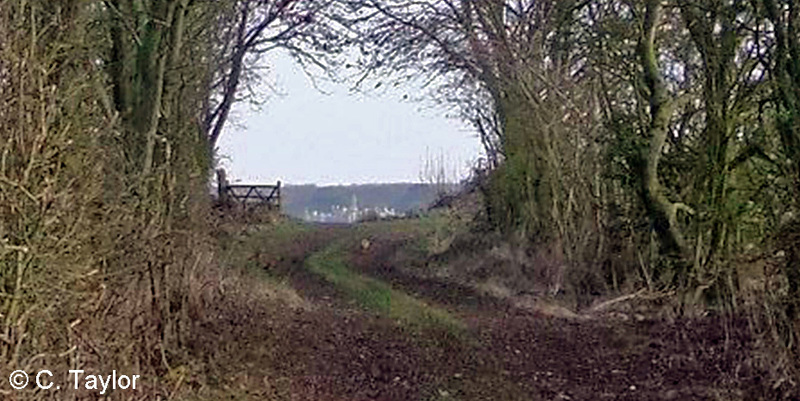 ...Harlaxton Manor in the distance. The final section of the walk reached a point where the land has been restored to agriculture. 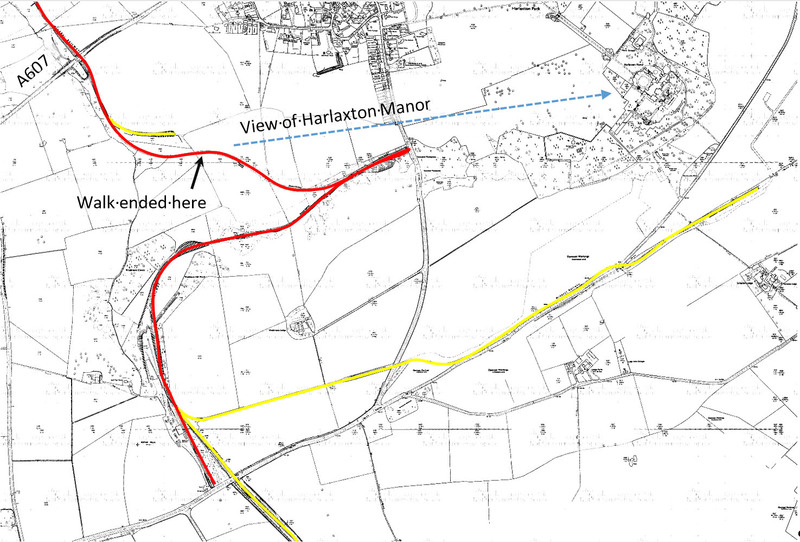 On this map of about 1970 the main line of the Harlaxton Quarry system is in red, the yellow lines indicate branches to those quarries that were still active in 1970. The land rises from north to south by about 180 feet across the area shown by this map. 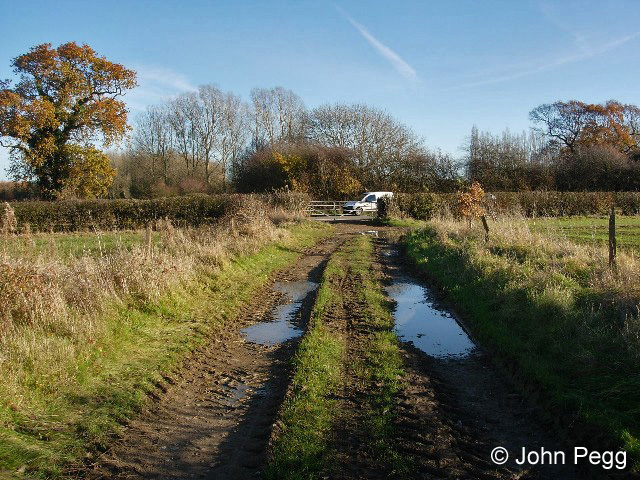 The main line was therefore laid out with a reversing point to assist with climbing the hill. Fortunately loaded trains were going downhill - only empty wagons needed to be brought up the bank. 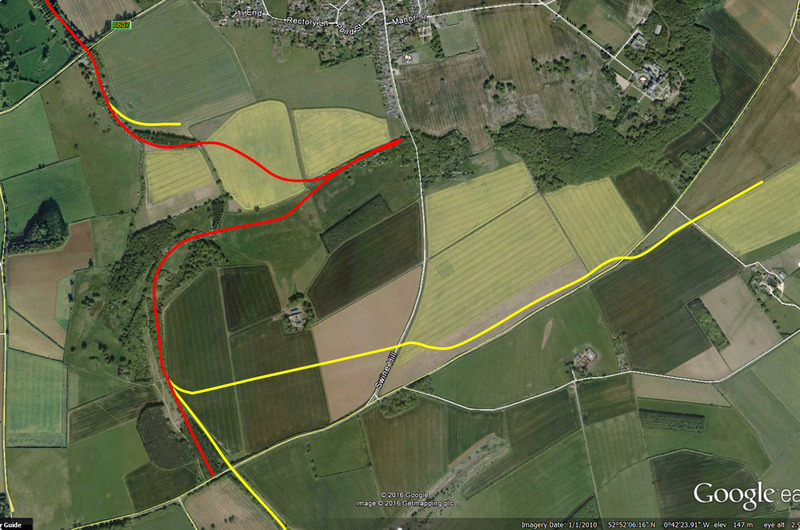 Here is a recent aerial photograph showing the route of the main line and branches in relation to the landscape today. Between 1941 and 1976 quarrying took place over most of the southern half of this view, and extended about ¼ mile south of the lower edge. Oh and not forgetting our new friend. 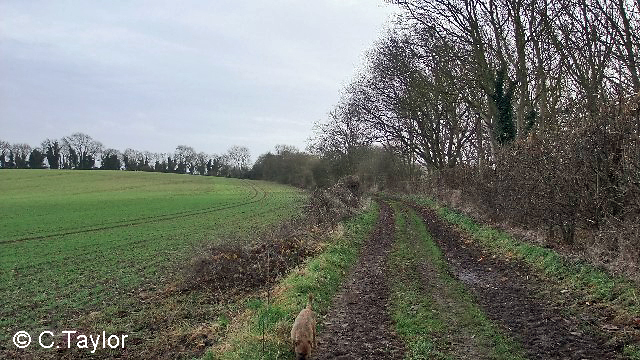 He showed us the way back, and when arriving where he joined us he shot off over the fields to where his owner was calling him! 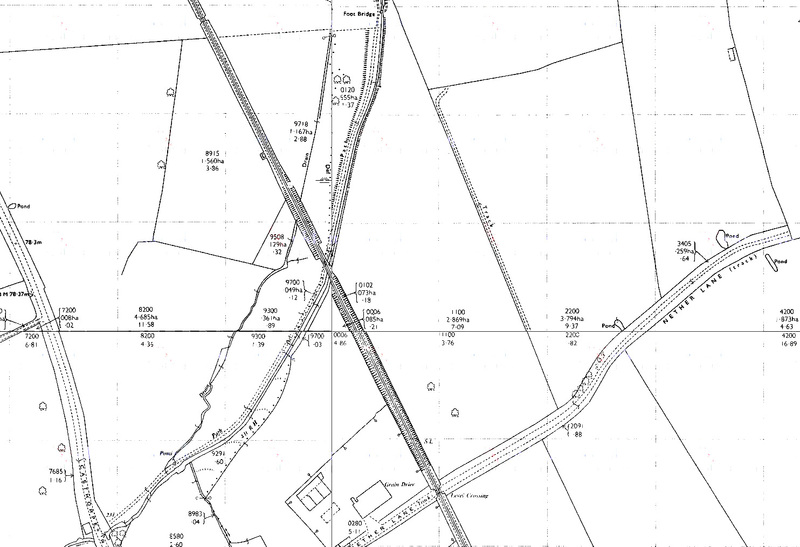 This is the engine shed and yard near the south end of the main line (the red line on the map) on 21st December 1971. 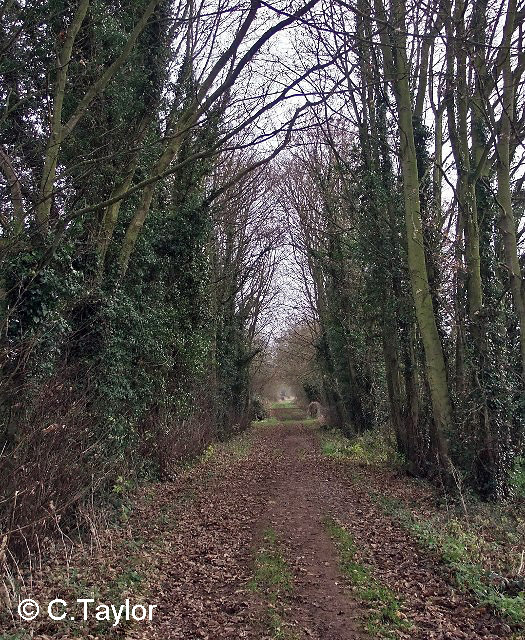 The three long, straight sidings are where groups of loaded wagons were assembled from the various quarries to be taken down the main line to Casthorpe Sidings. By this time the quarry's steam locomotive fleet had been replaced by second-hand diesels bought cheaply from British Railways. A wealth of information about the Harlaxton ironstone quarries, including photographs of the quarries in operation, can be found in The Ironstone Quarries of the Midlands: History, Operation and Railways Part 8: South Lincolnshire, pages 130-177 written by Eric Tonks, ISBN 978-1-907094-07-1.